Industry 4.0 is the digital transformation of industrial markets (industrial transformation) with smart manufacturing currently on the forefront. Industry 4.0 represents the so-called fourth industrial revolution in discrete and process manufacturing, logistics and supply chain (Logistics 4.0), the chemical industry, energy (Energy 4.0), transportation, utilities, oil and gas, mining and metals and other segments, including resources industries, healthcare, pharma and even smart cities. Industry 4.0 is the evolution to cyber-physical systems, representing the fourth industrial revolution on the road to an end-to-end value chain with Industrial IoT and decentralized intelligence in manufacturing, production, logistics and the industry. Originally Industry 4.0 was conceived in the context of manufacturing, yet this has changed. So, while all these industries fall under the scope of Industry 4.0 and are tackled in the academic, governmental and industrial collaborations which led to ‘Industrie 4.0’ but also to the evolutions after the term was coined you might still often read that Industry 4.0 is only about manufacturing, smart factories and activities, technologies and processes in the broader context of the factory, production and their most closely related areas. There is also a tendency to limit Industry 4.0 to (groups of) technologies such as IoT (the Internet of Things). To understand Industry 4.0 it is essential to see the full value chain which includes suppliers and the origins of the materials and components needed for various forms of manufacturing, the end-to-end digital supply chain and the final destination of all manufacturing, regardless of the number of intermediary steps and players: the end customer (in his/her capacity as an entrepreneur, consumer, building occupant, retail store owner, worker, citizen, patient and so forth). Enabling more direct models of personalized production, servicing, as well as customer/consumer interaction (including gaining real-time data from actual product usage) and cutting the inefficiencies, irrelevance and costs of intermediaries in a digital supply chain model, where possible, are some goals of Industry 4.0 in this customer-centric sense of increasingly demanding customers who value speed, (cost) efficiencies and value-added innovative services. In the end it remains business – with the innovative twist of innovation and transformation of business models and processes: increase profit, decrease costs, enhance customer experience, optimize customer lifetime value and were possible customer loyalty, sell more and innovate in order to grow and remain relevant (while selling new and/or high-value services on top of or instead of low-margin commoditized services, goods, products and ‘hardware’; or worse: services, solutions and products about to disappear due to so-called ‘digital disruption‘). This Industry 4.0 page gets regularly updated and is a continuous work in progress as in several areas evolutions happen fast. Moreover, Industry 4.0 is a vast reality, encompassing many societal, work-related, industry-specific and technological changes. If you are in a hurry and want to check out the topics that interest you most please use the table of contents below. If a section isn’t updated make sure to bookmark this page or come back soon given the frequent updates per section and the addition of new sections. Possibly you might also find more about the topics you seek in other articles on this websites we haven’t added here yet so do check out in our search function. What is Industry 4.0 (according to several sources)? The state of Industry 4.0: how are manufacturing companies doing? Industry 4.0 is the information-intensive transformation of manufacturing and other industries in a connected environment of data, people, processes, services, systems and IoT-enabled industrial assets with the generation, leverage and utilization of actionable information as a way and means to realize smart industry and ecosystems of industrial innovation and collaboration. Industry 4.0 is a broad vision with clear frameworks and reference architectures, mainly characterized by the bridging of physical industrial assets and digital technologies in so-called cyber-physical systems. A key role is indeed played by IoT, in the scope of Industry 4.0 Industrial IoT with its many components, from IoT platforms to Industrial IoT gateways, devices and much more. Yet, it’s not just IoT of course: cloud computing (and cloud platforms), big data (advanced data analytics, data lakes, edge intelligence) with (related) artificial intelligence, data analysis at the edge of networks (fog computing and edge computing), mobile, data communication/network technologies, changes on the level of, among others, HMI and SCADA, manufacturing execution systems, enterprise resource planning (ERP, becoming i-ERP), programmable logic controllers (PLC), sensors and actuators, MEMS and transducers (sensors again) and innovative data exchange models all play a key role. Additionally, the same technologies, such as Robotic Process Automation (RPA), AI (AI engines, machine learning), the meeting of both and so forth that pop up in close to all software areas such as enterprise information management, business process management and applications in the sourcing market are of course showing in IoT-enabled industrial/manufacturing applications and IoT manufacturing platforms as well. Industry 4.0 is not ‘something’ you realize overnight. Just as is the case with IoT deployments you need a strategic and staged approach. This is exactly the same as with digital transformation strategy and gets covered in depth when we look at Industry 4.0 strategy and implementation and at the state of Industry 4.0 and maturity of organizations as they move from initial stages and pilots to more innovative approaches on top of the traditional low-hanging fruit in terms of optimization and automation. If you are in a hurry, there is a chapter on Industry 4.0 maturity models and roadmaps. As you will discover in this guide Industry 4.0 is conceived as the next stage of organization and control in the full life cycle of the product value chain. The cyber-physical systems are the basis and enable new capabilities in areas such as product design, prototyping and development, remote control, services and diagnosis, condition monitoring, pro-active and predictive maintenance, track and trace, structural health and systems health monitoring, planning, innovation capability, agility, real-time applications and more. These latter capabilities also lead to the types of use cases and deployments as well as the benefits of industry 4.0 which we cover later and include personalization capabilities, real-time alerts and interventions, innovative service models, dynamic product improvement, increased productivity, higher up-time and, ultimately, new business models. The new capabilities of Industry 4.0 lead to the ‘smart anything’ phenomena which often get most attention: from smart grid, smart energy and smart logistics to smart facilities, including smart buildings and smart plants, and smart services to the mentioned smart manufacturing, smart factories, smart cities and so on. The cyber-physical system, its components (e.g. intelligent control systems and embedded software systems) and its place in the evolution of manufacturing and industry (starting from mechanical systems) is explained in depth in this guide. Industry 4.0 builds upon data models and data mapping across the mentioned end-to-end product life cyle and value stream. All the technologies in Industry 4.0 need to be seen in that perspective whereby integration is key. A first integration (or convergence) is that of information technology (IT) and operational technology (OT). Without IT and OT convergence there is no industrial transformation, let alone modern building management and several other areas where the silos between different traditional systems dissapear due to, among others, IoT on one hand and where IT and OT meet on the other, which is the case in close to all industries. The essence of IT and OT convergence revolves around data (and the systems where they have been sitting for many years), processes and people/teams. Again, the IoT is key here as also the Internet of Things starts with the capture (and subsequent analyses/leverage of data). It is safe to say that Industry 4.0 is only possible because of IoT. Since the convergence of IT, OT and their backbones (such as networks and infrastructure, whereby we can also add CT or communication technologies) essentially boils down to an advanced and enhanced application of Internet, IT technologies and IT infrastructure impacted by IoT data (cloud infrastructure, server infrastructure, storage and edge infrastructure etc.) many see Industry 4.0 as a continuation of the third industrial revolution. On the other hand, the impact of ongoing automation in all organizations, including factories, has a clear impact on work and society. Yet, here as well it is argued that this is merely a result of the next steps in the third industrial revolution where automation already was intensive on many levels. Regardless of those discussions it’s clear that the fourth industrial revolution aspect of Industry 4.0 has won the debates. Further in this guide we will explore the two key integrations in the Industry 4.0 model. The first is vertical integration whereby all the systems in the traditional automation pyramid are affected: from field level and control level to production level, operations level and enterprise planning level. Vertical integration will make the traditional automation pyramid view disappear. The same goes for several systems and applications across these various levels. Other systems such as ERP will dramatically change while still others will be replaced by rapidly emerging applications in the scope of Industrial IoT platforms, specifically manufacturing platforms and vertical platforms for various tasks and use cases in the many aspects of industry that get ever more features and become combined in an interoperable ‘systems of systems’ approach and by digital transformation platforms and business applications where IoT platforms and functionalities get integrated into. An additional element that is key to mention in this quick introductory overview is indeed that of semi-autonomous and autonomous decisions, cornerstones in both Industry and Logistics 4.0, the essence of the self-organizing plant and autonomous production vision and, ultimately, the dream of as much automation as possible with IoT, artificial intelligence, the new integrated systems, advanced analytics and so forth all playing a role. It directly touches upon what we cover next: Industry 4.0, technologies and workers whereby the view is one of augmented capabilities, different skills, savings on human labor and so on, whereby the promise is one where workers with ‘obsolete jobs’ will find other work (emphasis ‘the promise’ as until now significant job losses have been the result of automation). Before diving into all the mentioned evolutions, integrations, cyber-physical evolutions, IoT elements, big data aspects and before looking at the origins of Industry 4.0, definitions, evolutions, global implications, similar initiatives, Industry 4.0 design principles, building blocks and the Reference Architecture Model Industrie 4.0 a final word on technologies and people to wrap up this quick introduction. It is important to note that Industry 4.0 is not just about those technologies. It also looks at the impact on and role of society and workers (e.g. collaboration between man and machine as with collaborative robots or cobots, new required skillsets of workers in industries amidst all these changes and, inevitably, the loss of jobs due to ongoing automation as mentioned – and how to tackle this major challenge). An increasing number of vertical industries is adopting the technologies, concept and principles of Industry 4.0. Moreover, Industry 4.0 also has a strong focus on security. This does not just mean security of data and communication networks, data protection (including personal data protection, especially since the arrival of the General Data Protection Regulation, the ePrivacy Regulation and coming rules in several areas, including green facilities, energy and ecology, and again personal data in the wake of scandals that have emerged in consumer markets), cybersecurity in the broadest sense and industrial control systems security (ICS security) but also the protection and security of workers, industrial assets, critical infrastructure and ‘physical security’. As industrial assets and critical infrastructure (from critical power buildings to energy grids and more) get connectedand attacks are on the rise in the traditionally rather isolated industrial environments the stakes and dangers of vulnerabilities and attacks are huge in industry 4.0 which requires an end-to-end ‘security by design’ approach. This overall security challenge and certainly the ICS security and end-to-end cybersecurity challenge ranks high among the Industry 4.0 challenges and risks. On an Industry 4.0 technology level, finally, on top of the mentioned technologies (or rather groups of technologies) such as IoT, big data, IT, OT, several security technologies (cybersecurity, visual monitoring of critical facilities, wearables to monitor worker safety in hazardous environments), artificial intelligence (AI), cloud, edge, fog and more you can add: additive manufacturing and 3D printing, digital twins, virtual and augmented reality (also in the context of digital twin simulation), advanced robotics and cobots, autonomous production, rapid application development, autonomous production, consistent engineering across the entire value chain, thorough data collection and provisioning, systems integration (cfr. vertical and horizontal integration), a vast range of networking and communication technologies, integration and connectivity standards/protocols, ways to make various IT and OT protocols interoperable and far more on the horizon, such as blockchain and technologies to not just meet demands for more bandwidth but also to power connected devices such as the new Power over Ethernet standard and soon visual light communications (VLC) or LiFi (Light Fidelity), which has entered the LiFi IEEE standardization stage and will be adopted for several specific industrial use cases beyond its current smart lighting scope. On the technological front it’s important to look at the technologies underneath terms such as IoT but also to look at how it all connects, especially as on this technology level (where data and how you leverage, protect, exchange, enrich and even monetize it is at the center as you can see in the above list) the keyword is integration as well: from the integration of IT and OT to the integration of IoT and AI; big data, IoT and AI; blockchain and IoT and security, the list becomes longer by the day, although it’s of course about the use cases and combinations and integrations can happen in multiple ways. This more or less summarizes the key aspects, elements and evolutions in Industry 4.0 for professionals. In the rest of this page we look deeper at the mentioned elements and more. Some are in the guide itself, others are added and for the time being linked to. When Germany launched a project under the name ‘Industrie 4.0’ to digitalize manufacturing at the Hannover Messe in 2011, the government officials, industry leaders and academics who were working on the project probably had no idea that Industry 4.0 and specifically that fourth industrial revolution would become such a widely used concept. 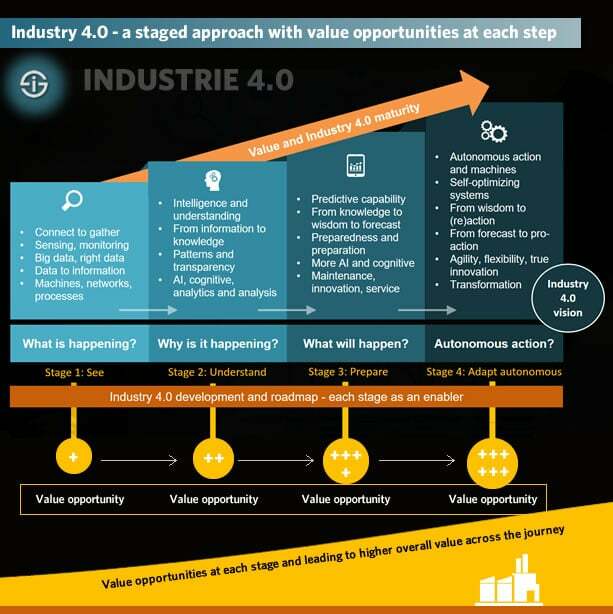 Although the term Industry 4.0 and the reference architecture model behind it originate from Germany (hence ‘Industrie 4.0’) and there is major key focus on production and manufacturing it’s clear that the vision – and reality – of the fourth industrial revolution has caught the attention of organizations across the globe as we’ll explore at the end of this article and that the scope de facto stretches beyond manufacturing, let alone factories as previously mentioned. Although Industry 4.0 originally was only used for manufacturing (in contrast with other leading initiatives such as the Industrial Internet and the Industrial Internet Consortium or IIC), it is de facto going further. In the early days of the Industry 4.0 view we wouldn’t have been able to say that; it was a manufacturing initiative, period. Today, we clearly see how the several parties which were involved in Industry 4.0 themselves move it to smart transportation and logistics, smart buildings, smart mining, smart oil and gas, smart healthcare and smart ‘x’ or ‘anything’. We clearly see this expansion across other verticals on top of manufacturing in the material that gets published by leading Industry 4.0 institutes such as the German national academy of science and engineering (acatech). This doesn’t mean that they (alone) are broadening the scope, the opposite is true (as well): the mentioned vertical industries (and others) are increasingly adopting the Industry 4.0 concept, principles and technologies. How else could it be? It’s not as if manufacturing lives in splendid isolation and, despite the specific characteristics, processes and priorities in manufacturing, the underlying technological and transformational traits do overlap in this hyper-connected age. This global diffusion of the Industrie 4.0 vision and technologies, at different speeds, is related with the universal challenges and possibilities across the globe and with the cross-fertilizations, enabled by collaborations with the US industry, the Japanese industry, EU industry initiatives and so forth. Still, there are several hurdles to take before the Industry 4.0 vision is realized in more companies than is the case today. Despite the vision aspect, ‘Industry 4.0’, is a very real phenomenon, transforming manufacturing and other sectors into connected and digital manufacturing (and more) with additional benefits and a range of technological evolutions and possibilities to move beyond the sheer operation dimension towards the so-called fourth industrial revolution. Industry 4.0 is the digital transformation of manufacturing, leveraging third platform technologies and innovation accelerators in the convergence of IT (Information Technology) and OT (Operational Technology) to realize connected factories and industry, smart decentralized and self-optimizing systems and the digital supply chain in the information-driven cyber-physical environment of the 4th industrial revolution (sometimes called 4IR). Industry 4.0 also stands for the fourth industrial revolution as such. It is a new stage in the organization and control regarding the end-to-end value chain across the life cycle of products whereby increasing demand of customers for personalization is a driving force and flexibility, as-a-service models and the use of information technology go hand in hand with a move towards more autonomous decision making, a changing role for the workforce, new industrial organizational and collaborative paradigms and connected cyber-physical systems with security by design and turning data from various IT and OT systems into intelligence, decisions and new business models as leading principles. The initial goals in Industry 4.0 typically are automation, (manufacturing) process improvement and productivity/production optimization; the more mature goals are innovation and the transition to new business models and revenue sources with information and services as cornerstones. Industry 4.0 is also called ‘smart industry’, ‘intelligent industry’, ‘smart factory’ or ‘smart manufacturing’. In many senses it is related to the Industrial Internet and since 2016 the Industrial Internet Consortium and Industry 4.0 platform, “Plattform Industrie 4.0”, indeed started collaborating. This is probably not the shortest Industry 4.0 definition ever and it does contain some terms we might need to explain further such as the third platform and innovation accelerators as they exist in the DX (digital transformation) economy, as well as the integration of IT and OT, which is key in the cyber-physical context of Industry 4.0 as we’ll see. The definition of Industrie 4.0 as proposed in 2011 was pretty lengthy too. In a paper, entitled “Industrie 4.0 – Smart Manufacturing for the Future”, GTAI (Germany Trade and Invest) looked at the questions what is smart industry (a synonym of Industry 4.0) and what Industrie 4.0 means. An extract: Smart industry or “INDUSTRIE 4.0” refers to the technological evolution from embedded systems to cyber-physical systems…INDUSTRIE 4.0 represents the coming fourth industrial revolution on the way to an Internet of Things, Data and Services. Decentralized intelligence helps create intelligent object networking and independent process management, with the interaction of the real and virtual worlds representing a crucial new aspect of the manufacturing and production process”. And it’s not done! More in the paper (PDF opens) and in our Industry 4.0 definitions list below. Obviously not all definitions of Industry 4.0 are the same. Industry 4.0 in practice means many things for many people and what some consider a definition of Industry 4.0, others won’t. Industry 4.0 has been defined as “a name for the current trend of automation and data exchange in manufacturing technologies, including cyber-physical systems, the Internet of things, cloud computing and cognitive computing and creating the smart factory”. This Industry 4.0 definition is close to the original definition but not entirely correct or at the very least not correct anymore as Industry 4.0 goes beyond the factory, is also about more than automation and data exchange (e.g. the key role of workers, the key role of energy efficiency etc). Looking for more Industry 4.0 definitions? Below is a curated list of sources with their own definitions and views on what Industry 4.0 is and means. The first industrial revolution, which REALLY was a revolution, and, among others thanks to invention of steam machines, the usage of water and steam power and all sorts of other machines, would lead to the industrial transformation of society with trains, mechanization of manufacturing and loads of smog. The second industrial revolution is typically seen as the period where electricity and new manufacturing ‘inventions’ which it enabled, such as the assembly line, led to the area of mass production and to some extent to automation. The third industrial revolution had everything to do with the rise of computers, computer networks (WAN, LAN, MAN,…), the rise of robotics in manufacturing, connectivity and obviously the birth of the Internet, that big game changer in the ways information is handled and shared, and the evolutions to e-anything versions of previously brick and mortar environments only, with far more automation. In the fourth industrial revolution we move from ‘just’ the Internet and the client-server model to ubiquitous mobility, the bridging of digital and physical environments (in manufacturing referred to as Cyber Physical Systems), the convergence of IT and OT, and all the previously mentioned technologies (Internet of Things, Big Data, cloud, etc.) with additional accelerators such as advanced robotics and AI/cognitive which enable Industry 4.0 with automation and optimization in entirely new ways that lead to ample opportunities to innovate and truly fully automate and bring the industry to the next level. Some also like to add the injection of technology and connectivity in the human/digital mind and body convergence to Industry 4.0. The injection of AI, hyper-connectedness and data analysis into how things, machines, communicate, act and lead to actionable insights with an omnipresence of the Internet of Everything in virtually each piece/machine of the Industry 4.0 dream is one thing, the convergence of man and machine (or technological extension) is still a bit further away and it’s so complex and will lead to so many more debates (also ethical) that it’s already called the fourth platform by IDC. In the view of the Boston Consulting Group (we tackle their Industry 4.0 research below) Industry 4.0 refers to the convergence and application of nine digital industrial technologies: advanced robotics, additive manufacturing, augmented reality, simulation, horizontal/vertical integration, Industrial Internet, the cloud, cybersecurity and Big Data and Analytics. It’s clear that today some companies have invested in a few of these technologies; predominantly the traditional pillars of the third platform such as cloud and Big Data / Analytics and, increasingly in the Industrial Internet of Things from an integrated perspective and thus overlapping with several of these “technologies” or maybe better: sets of technologies and connected benefits. Obviously, it wasn’t just in Germany (and Europe) that the digital transformation of manufacturing (and some related industries and processes) was occurring with industrial giants in the Industry 4.0 space (Bosch, Siemens, you name it). As mentioned, in the US, GE and a range of other industrial players (including non-American ones who are also members of the “Plattform Industrie 4.0”) launched the Industrial Internet Consortium. The Industrial Internet, as we wrote previously a term coined by American industrial giant GE, looked pretty much like Industry 4.0., although in the Boston Consulting Group image above it is mentioned as one of the enabling industrial technologies in the network of machines and products and networked objects communications sphere of IIoT. The difference between Industry 4.0 and the Industrial Internet, however, is that, originally, the Industrial Internet was seen as the third industrial innovation wave. So, a third wave of innovation instead of a fourth revolution in the industry. The Industrial Revolution. The real one and more or less a combination of the first and second revolution in the Industry 4.0 view. The Internet Revolution: ‘computing power and the rise of distributed information networks’. The Industrial Internet: what is called the fourth industrial revolution in Industry 4.0. Today the concept of four industrial revolutions, however, has gained widespread adoption and so has Industry 4.0. The Industrial Internet Consortium had a more cross-industry approach than German “Plattform Industrie 4.0” (the Industry 4.0 Platform), which was more focused on manufacturing (although it’s also used for logistics and more, see Logistics 4.0). As both the Industrial Internet Consortium and Plattform Industrie 4.0 shared many efforts and views, and more and more companies became member of both platforms, both organizations started looking at similarities and collaboration. After all, we still do live in a globalized world, certainly in industrial production and related markets. So, collaboration became obvious, even more so because both industry bodies were working on an architectural framework. In the context of Industry 4.0 and “Plattform Industrie 4.0” this framework is known as RAMI 4.0, short for the Reference Architecture Model for Industrie 4.0. The Industrial Internet Consortium’s framework is known as IIRA, short for the Industrial Internet Reference Architecture. Early 2016 the Industrial Internet Consortium and Plattform Industrie 4.0 announced their collaboration, with a focus on standardization, the architecture for the “new” manufacturing, the business goals and the role of the Internet of Things in it all. If you look at Industry 4.0 today you’ll notice that there is also an increasing attention for industries, other than manufacturing as already was the case in the Industrial Internet Consortium and that cyber-physical systems, which we’ll tackle next are seen beyond the scope of cyber-physical production systems but also as the enablers of, among others condition monitoring and remote possibilities, which in term don’t just enable and drive the smart factory. All revolutions and associations aside, the question is how far we are in Industry 4.0. Are manufacturing companies fully ready? And what means readiness in this industrial context to begin with? In other words: what are the characteristics, principles, technological maturity levels, (achieved and desired) benefits and realizations and where do we start with Industry 4.0 or the Industrial Internet? As you’ll notice the answers to these questions are very similar to those in digital transformation across any industry and as in any digital transformation strategy challenge. After all; in the end, regardless of the different technologies and market context in manufacturing, digital transformation is a universal given in any industry whereby similar capabilities and outcomes are sought. Yet, as mentioned in the beginning of this article, Industry 4.0 is a vision and reality with projects and clear steps towards the vision. Industry 4.0, which in more than one way as said is the digital transformation of manufacturing, today still is mainly focused on the first stages of transformation and ‘maturity’ from a benefit and potential perspective: enhancing productivity, automation and the optimization of operational processes, business processes and, the number one Internet of Things use case from an IoT spending perspective: manufacturing operations, followed by (predictive) maintenance and smart maintenance services. This is also what the Boston Consulting Group found in a December 2016 report: companies are implementing Industry 4.0 but in rather ad hoc and isolated ways. This is exactly the same phenomenon we see in any industry that is in digital transformation – or revolution if you prefer. It’s that first stage in a broader ecosystem of possibilities as organizations move from more or less obvious goals to true innovation and even disruption. The illustration below from the Boston Consulting Group shows some aspects of this broader ecosystem of possibilities, beyond the enhance productivity dimension. In other words: MOST manufacturing and industrial companies (there are plenty of exceptions and we mention several across this site) are still in that stage where the intention to transform exists and isolated efforts exist but there is often a lack of a bigger picture, a broader strategy or, as the Boston Consulting Group calls it in the Industry 4.0 context ‘a comprehensive program’. Industry 4.0 ranks high on the agenda, yet in practice one or two isolated aspects of Industry 4.0 are implemented, the company says. Examples: big data and/or robotics. This is really the first stage of maturity whereby there is also a focus on the mentioned optimization and automation goals and gains, which is perfectly normal but it shouldn’t stop there. You can perfectly compare this with the findings of IDC regarding the gradual evolution from Internet of Things pilot projects to more scalable deployments, whereby IDC found that the sought benefits of these deployments are mainly focused on internal goals and on operations. This situation is poised to remain like that for a while tough as, despite the increasing number of large IoT projects, the Internet of Things is more seen as strategic and tactical than transformational and internal goals are key. As the image below shows, enhancing productivity, reducing costs and the automation of internal processes dominate. It’s clear that in companies that are further from a benefit perspective and look at better customer service, new revenue streams, changes in business models and innovation, IoT deployments go further. Where the Boston Consulting Groups says that the vast majority of respondents see Industry 4.0 as an opportunity to improve productivity – and analyzes how this is done in practice- the parallels are crystal clear. So, what does it take to move to those next maturity stages? Not for the sake of maturity but for the sake of moving beyond that enhanced productivity towards higher agility, real-time opportunities, the development of an innovative capability and true innovation, identifying new information-driven and service-oriented sources of revenue and many more goals? The answers are again the same as in all digital transformations, as are the challenges. Developing new competencies, finding new opportunities in the equation of intelligence, people, processes and innovation, and creating competitive benefits and services which can have an important impact on the business model and even the industry as a whole, requires more than projects and more than productivity. The definition of a strategy (for Industry 4.0), challenge number one. The rethinking of the organization and processes to maximise outcomes. Making the organization realize action is needed. Change management, so often overlooked. A true interconnection of departments. Information management excellence as it’s all about actionable intelligence and connected information and process excellence in a context of relevance, innovation and timely availability for any desired business, employee AND obviously customer goal. (Cyber)security (and privacy). The increasing number of attacks in the Industrial Internet of Things are a fact as IT and OT converge. Moreover, one of the main reasons which hold IIoT initiatives back are concerns regarding security and IIoT is, as said a key component of Industry 4.0. The challenges regarding the integration of IT and OT. Managing risk and lowering costs in uncertain times. Dealing with the complexity of the connected supply chain. A better understanding of IT and OT technologies and, more importantly, how they can be leveraged. Altering customer and industrial partner demands. Competition and the fact that Industry 4.0 champions gain a competitive benefit fast. The eternal and extremely important human challenge (talent, future of work, employment,…..). While leading manufacturers are overcoming the mentioned challenges and some already have, others will need to step up their pace. It’s not a coincidence that the Boston Consulting Group report is entitled ‘Sprinting to Value in Industry 4.0’. Is fear of others taking the lead a good advisor? No? Do you need to start somewhere? Yes, and you can. Is it, even if fear is a bad advisor, time to sprint to value in Industry 4.0 in a world where digital transformation is a marathon with several sprints? Looking at what the best in class are doing we would say yes. 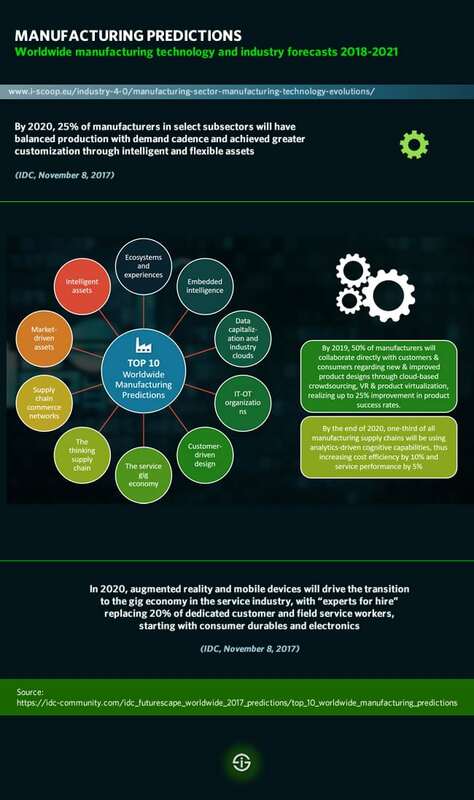 Moreover, there are some predictions you might want to look at, such as this first one from an IDC article with 10 predictions for the manufacturing industry, as summarized end 2016: By 2018, only 30 percent of manufacturers investing in digital transformation will be able to maximize the outcome; the rest are held back by outdated business models and technology. Whether it’s Industry 4.0, Smart Industry or the Industrial Internet, there are ample benefits for manufacturers to transform the way they work. We’ve mentioned some benefits, risks and challenges earlier in this overview but let’s look a bit closer at some of the main advantages. Several of them are also explored more in depth in other articles on this site. The essential goal of Industry 4.0 is to make manufacturing – and related industries such as logistics – faster, more efficient and more customer-centric, while at the same time going beyond automation and optimization and detect new business opportunities and models. 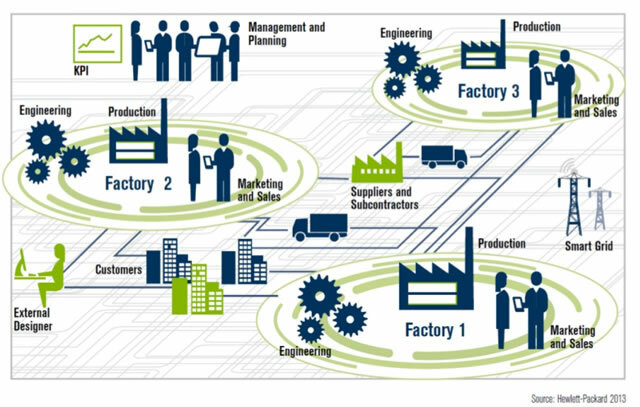 Most of the benefits of Industry 4.0 are – obviously – similar to the benefits of the digital transformation of manufacturing, the usage of the IoT in manufacturing, operational and business process optimization, information-powered ecosystems of value, digital transformation overall, the Industrial Internet and many other topics on our website. However, let’s summarize a few of the key benefits of Industry 4.0. As mentioned in the section on the state of Industry 4.0, optimization of processes and of productivity is the first benefit that manufacturers see. It’s also one of the first goals of Industry 4.0 projects. In other words: saving costs, increasing profitability, reducing waste, automating to prevent errors and delays, speeding up production to work more in real-time and in function of the overall value chain, where speed is crucial for everyone, digitizing paper-based flows, being able to intervene faster in case of production issues and so forth. It’s the low hanging fruit, yet important. On top of the research from BCG we mentioned earlier, the signs that investments are done in these areas first are clear. Again, it’s not a coincidence that, from a spending perspective, the number one use case in which manufacturers invest their Internet of Things (IoT) budgets is manufacturing operations (a whopping $102.5 billion on a total of IoT $178 billion across all manufacturing use cases in 2016). Industry 4.0 offers various solutions to optimize, from optimized asset utilization and smoother production processes to better logistics and inventory management. While we just mentioned speed in a context of optimization, automation and enhanced productivity, it is a benefit in many other ways as well. A lot of the productivity improvement benefits are rather about the internal goals of costs and process optimization. Yet, at the same time several also fit in a perspective of enhanced customer-centricity. Industry 4.0 is about the entire life cycle of products and manufacturing obviously doesn’t stand on its own. If you look at the entire value chain and ecosystem within which manufacturing operations reside there are many stakeholders involved. These are all customers. And customers also want enhanced productivity, regardless of where they sit in the supply chain. If the final customer wants good products fast and has increased expectations regarding customer experience, quality, service and products that are delivered on the exact time they want, this impacts the whole supply chain, all the way up to manufacturing and beyond. Speed is not just a competitive advantage and customer expectation in an increasingly real-time economy, it’s also a matter of alignment, costs and value creation. Moreover, customers simply expect it. Once again the crucial role of data and information surfaces. Industry 4.0, smart factories, supply chains, informed customers, alignment: it’s all about data, from the actual operations to the delivery of a product to an end customer and beyond. The more data you gather early on and the more timely this data gets where it matters when it matters, the more value down the supply chain. In fact, this is the essence of one of the three dimensions of RAMI 4.0, the Reference Architecture Model Industry 4.0, which we tackle below. When an industrial asset gets broken it needs to be fixed. That costs time, money and very often a lot of moving around by support people and engineers. When a key industrial asset, such as an industrial robot in a car manufacturing plant gives up, it’s not just the robot that’s broken. Production is affected, costing loads of money and unhappy customers, and sometimes production can be fully disrupted. It’s everyone’s worst nightmare as business continuity is an extremely high concern. On top of all the replacement/fixing work, resources and costs, reputation can be damaged, orders can be cancelled and with each hour that passes money is thrown away. If industrial assets are connected and can be monitored (health status monitoring, for instance) through the Internet of Things and issues are tackled before they even happen the benefits are huge. Alerts can be set up, assets can be proactively maintained, real-time monitoring and diagnosis becomes possible, engineers can fix issues, if they do occur from a distance, the list goes on. Moreover, patterns and insights are gained to optimize in areas where things seem to have issues more often and a world of new maintenance services opens up as we’ll see. No wonder that asset management and maintenance are the second largest area of IoT investments in manufacturing. We mentioned that customers want speed. However, that doesn’t mean they are ready trade quality for speed, well on the contrary. If you have everything in your production system and its broader environment hooked up with sensors, software, IoT technologies, systems of insight AND the customer, you can also enhance quality of your products. Automation definitely plays a big role here and so do the typical components of cyber-physical systems (more below) and the Internet of Things whereby quality aspects can be monitored in real-time and robots reduce errors. On the flip side and one of the risks and challenges to tackle, as mentioned earlier: the more you automate, the less work for people, in theory. And the same goes for other mentioned benefits such as maintenance (the less you need engineers for support, the less support engineers you need). It’s a dilemma and known issue which we’ll cover later. In the meantime do know that robots are not going to take all human jobs over soon. Ample companies have increased the usage of robots and at the same time hired more. The reason we mention it in the context of quality is that this is certainly one area where you see cobots popping up (cobots is a fancy term for advanced collaborative robots or put more simply: robots that fit a collaboration between man and machine). Talking about people, the human (and social) dimension is ubiquitous in Industry 4.0. Moreover, if we look at the possibilities and benefits, that human, social and even environmental aspect is key in the goals of Industry 4.0. Improving working conditions based on real-time temperature, humidity and other data in the plant or warehouse, quick detection and enhanced protection in case of incidents, detection of presence of gasses, radiation and so forth, better communication and collaboration possibilities, a focus on ergonomics, clean air and clean factory initiatives (certainly in Industry 4.0 as the EU wants to be leading in clean air and clean anything technologies), the list goes on. We all know it: consumer behavior and preferences have changed. Digital tools have changed the ways we work, shop and live. People have also become more demanding, among others with regards to fast responses and timely information/deliveries as mentioned earlier. On top of that consumers also like a degree of personalization, depending on the context. Take sports shoes, for instance. Once a few colors of the same shoe were enough, know we want the ability to customize them in whatever way. On top of that another phenomenon is taking place and it does disrupt traditional supply chains. Consumers increasingly get (and want) possibilities to have a direct interaction with a brand and its manufacturing capability. Digital platforms to customize products as mentioned, shortened routes between production and delivery, possibilities to co-create and so on. In many manufacturing environments these things already happen. And it’s not just in a consumer environment. We increasingly see customization in a B2B context as well, even if it’s just to stick a label, add a custom feature or adapt any characteristic of the product whatsoever. If you want to offer these services at scale and even turn them into a competitive advantage, automation and several technologies and processes in industry 4.0 become a necessity. A real-life example without disclosing the details: a large bank wanting specific office equipment to use across all its branches (customer-facing context) with its own look, feel and features as part of a rebranding. There are plenty more examples. Now that we speak about competitive benefits and customization we also need to tackle agility, scalability and flexibility. The same scalability and agility which we expect from supporting IT services and technologies, such as the cloud, are expected in manufacturing. This is partially related with the previous topic of customization but mainly is about leveraging technologies, Big Data, AI, robots and cyber-physical systems to predict and meet seasonal demand, fluctuations in production, the possibility to downscale or upscale; in other words: all the adjustments that are sometimes more or less predictable, can be made more predictable or are not predictable but can be handled thanks to increased visibility, flexibility and a possibility to leverage assets in function of optimal production requirements from a perspective of time and scale. Digital transformation, as you can read in our digital transformation strategy overview, is a matter of many levels, steps and capabilities. You can transform processes, specific functions, customer service, experiences and skillsets but in the end true value is generated by tapping into new, often information-intensive, revenue sources and ecosystems, enabling innovative capabilities, for instance in deploying an as-a-service-capacity for customers, advanced maintenance services and so on. In the end, Industry 4.0 is also about that. It’s a topic we wrote about very often. You can read more about it in our article on the digital transformation of manufacturing. As mentioned previously, it’s important to point out that Industry 4.0 is still mainly a vision. Does this mean it is just a vague idea? No, on the contrary. What we do see indeed though is that most organizations are still in the early stages of preparations for Industry 4.0 and mainly working ad hoc for now. Yet, the vision of Industry 4.0 is far more studied and documented that that of other evolutions. Let’s compare digital transformation and the role in it of the Industrial Internet of Thing, which along with evolutions in mechanics, engineering and manufacturing, essentially are what Industry 4.0 is about. Digital transformation, although being academically looked upon and despite the existence of numerous digital transformation frameworks and roadmap strategies, which are developed by numerous people, has no universal definition nor clear industry-wide approach. The same goes for the implementation of the Industrial Internet of Things. Just like digital transformation and the Industrial Internet of Things, adoption of Industrie 4.0 happens in the individual context of an organization. However, Industry 4.0, which is about more than automation in manufacturing and ultimately also shows a vision of transformation in the end, is thoroughly studied, prepared and presented by a big platform with academia, companies and far more as it was a clear mandate. In essence this means that in Industry 4.0 there is a body of work, reference models, roadmaps and well-described components before the actual implementations really happened. That is pretty unique. So, just like digital transformation, Industry 4.0 requires a staged approach whereby the initiatives in the earliest maturity stages and areas ultimately lead to the realization of an integrated vision and reality. Yet, as opposed to digital transformation this vision and reality is far more studied, documented and standardized (despite the mentioned need to work in the context of the individual business as well). In the Industry 4.0 maturity models there are several ways to look at the mentioned staged approaches. One such maturity approach looks at the information and actual operations and manufacturing systems perspective with autonomous machines and systems as true Industry 4.0. In this gradual approach, whereby each stage builds upon the next one and adds more value, we move from data to information to knowledge to wisdom and action from a data perspective. Indeed, the good old DIKW model. From the perspective of systems and equipment/machines these stages correspond with, respectively seeing what is happening (data), knowing why it’s happening (analytics, knowledge), predicting what will happen (based upon the patterns and capabilities we developed before and AI) to the ultimate step Industry 4.0 strives for: an autonomous reaction by autonomous machines within the self-optimizing Industry 4.0 systems. A second maturity approach revolves more around the business as such and corresponds with what you would typically see in any project. What do we want to achieve and what do we have today (assess), where do we want to go and what are the missing links to get there (called the methodological analysis in Industrie 4.0, of which gap analyis is part) and then the deployment of a strategic plan with a clear roadmap with regards to processes, security, skills, technologies and implementation. And, as is always the case this is of course followed by monitoring and improvement. Cyber-physical systems (CPS) are building blocks in Industry 4.0 on one hand and part of the Industry 4.0 vision on the other. Cyber-physical systems are combinations of intelligent physical components, objects and systems with embedded computing and storage possibilities, which get connected through networks and are the enablers of the smart factory concept of Industry 4.0 in an Internet of Things, Data and Services scope, with a focus on processes. Simply put, as the term indicates, cyber-physical systems refers to the bridging of digital (cyber) and physical in an industrial context. This might still seem complex but, then again, cyber-physical systems are complex. Moreover, the term isn’t new and is better known in an engineering and industry context. It fits more in the Operational Technology (OT) side of the converging IT/OT world which is typical in Industry 4.0 and the Industrial Internet. So, if you want to understand Industry 4.0 or the Industrial Internet, you’ll need an understanding of some essential operational, production and mechanics terms. Cyber-physical systems in the Industry 4.0 view are based on the latest control systems, embedded software systems and also an IP address (the link with the Internet of Things becomes clearer, although strictly both are not the same but they certainly are twins as we see in the next ‘chapter’. In the Industry 4.0 context of mechanics, engineering and so forth, cyber-physical systems are seen as a next stage in an evolution of an ongoing improvement of enhancement and functions integration. Looking at Industry 4.0 as the next new stage in the organization and control of the value chain across the lifecycle of products, this ongoing improvement in which CPS fits started from mechanical systems, moved to mechatronics (where we use controllers, sensors and actuators, more terms that are familiar in IoT) and adaptronics, and is now entering this stage of the rise of cyber-physical systems. Cyber-physical systems essentially enable us to make industrial systems capable to communicate and network them, which then adds to existing manufacturing possibilities. They result to new possibilities in areas such as structural health monitoring, track and trace, remote diagnosis, remote services, remote control, condition monitoring, systems health monitoring and so forth. And it’s with these possibilities, enabled by networked and communicating cyber-physical modules and systems, that realities such as the connected or smart factory, smart health, smart cities, smart logistics etc. are possible as mentioned previously. In the original definitions, going back over a decade, IP addresses where not specifically mentioned in cyber-physical systems. In 2008, Professor Edward A. Lee from the University of California, Berkeley, defined Cyber-Physical Systems as follows: “Cyber-Physical Systems (CPS) are integrations of computation and physical processes. Embedded computers and networks monitor and control the physical processes, usually with feedback loops where physical processes affect computations and vice versa”. On his page on the Berkeley website, Professor Lee links to cyberphysicalsystems.org where you find his definition and a CPS concept map in the form of a mind map where you can click the various components to read more. For the German Industrie 4.0 academia and industry people, CPS (and that bridging of cyber/digital and physical) was key in Industry 4.0. Cyber-physical systems also include dimensions of simulation and twin models, smart analytics, self-awareness (self-configuration) and more . We’ve tackled some of these topics, including digital twins, previously. Hopefully, the essence of the concept, context and reality of the evolution towards cyber-physical systems has become a bit clearer now. Note: there is a difference between cyber-physical systems and cyber-physical manufacturing systems or cyber-physical production systems (CPSS) where we move from the technological component to the far more important process and application dimension. Next, we take a deeper look into the Internet of Things and its place in Industry 4.0. You’ll notice that both are virtually twins. Cyber-physical systems are seen as a next evolution in manufacturing, mechanics and engineering. The essential dimensions are the bridging of digital and physical, which is possibly thanks to Internet technology, and the bridging/convergence of Information Technology and Operational Technology. Cyber-physical systems can communicate. They have intelligent control systems, embedded software and communication capabilities as they can be connected in a network of cyber-physical systems. Cyber-physical systems can be uniquely identified. They dispose of an IP (Internet Protocol) address which means that they use Internet technology and are part of an Internet of Everything in which they can be uniquely addressed (each system has an identifier). Cyber-physical systems have controllers, sensors and actuators. This was already the case in previous stages before cyber-physical systems (mechatronics and adaptronics); however as we’ll see with the Internet of Things it plays an important role. Cyber-physical systems are the basic building blocks of Industry 4.0 and the enablers of additional capabilities in manufacturing (and beyond) such as track and trace and remote control (more about these capabilities in the next section on CPS and the Internet of Things). The capabilities which are possibly thanks to cyber-physical systems enable smart factories, smart logistics (Logistics 4.0) and other smart areas of applications, among others in energy, oil and gas, and utilities. As promised, time for the Internet of Things. The Internet of Things (IoT) is omnipresent in Industry 4.0 and its international counterparts, as mentioned previously. As you can read on our page on the Industrial Internet of Things (IIoT) and deduct from the graphic above on cyber-physical systems, CPS essentially is mainly about the Industrial Internet of Things. The presence of an IP address by definition means that cyber-physical systems, as objects, are connected to the Internet (of Things). An IP address also means that the cyber-physical system can be uniquely identified within the network. This is a key characteristic of the Internet of Things as well. Cyber-physical systems are also equipped with sensors, actuators and all the other elements which are part of the Internet of Things. Cyber-physical systems, just like the Internet of Things need connectivity. The exact connectivity technologies which are needed depend on the context (in both). The Internet of Things consists of objects with embedded or attached technologies that enable them to sense data, collect them and send them for a specific purpose. Depending on the object and goal this could be capturing data regarding movement, location, presence of gasses, temperature, ‘health’ conditions of devices, the list is endless. This data as such is just the beginning, the real value starts when analyzing and acting upon them, in the scope of the IoT project goal. IoT devices can also receive data and instructions, again depending on the ‘use case’. All this applies to cyber-physical systems as well, which are essentially connected objects. There are more similar characteristics but you see how much there is in common already. Moreover, the new capabilities which are enabled by cyber-physical systems, such as structural health monitoring, track and trace and so forth are essentially what we call Internet of Things use cases. In other words: what you can do with the Internet of Things. Some of them are used in a cross-industry way, beyond manufacturing. Below are two examples of CPS-enabled capabilities we tackled previously and how they really are IoT uses cases. Track and trace possibilities in practice lead to multiple IoT use cases in, among others, healthcare, logistics, warehousing, shipping, mining and even in consumer-oriented Internet of Things use cases. There are ample applications of the latter with numerous solutions and technologies. You can track and trace your skateboard, your pets, anything really, using IoT. Structural health monitoring is also omnipresent, mainly across industries such as engineering, building maintenance, facility management, etc. With the right sensors and systems you can monitor the structural health of all kinds of objects, from bridges and objects in buildings to the production assets and cyber-physical assets in manufacturing and Industry 4.0. The new capabilities, of which we just mentioned two and which are possible thanks to CPS in the Industry 4.0 view, in turn enable smart plants, smart factories and anything smart. What is a core enabler of smart logistics and so forth? Indeed, the (Industrial) Internet of Things, beyond its simple aspects of sensors, actuators, communication capabilities and data collection/analytics. You can perfectly compare this with the Internet of Everything view of connected objects, people, processes and data as the building blocks of smart applications. It is another key similarity between the CPS view of industry 4.0 and the reality of the Internet of Things, which is key in Industry 4.0. To conclude: in fact, you can call cyber-physical systems the (albeit advanced) things in the Industrial Internet of Things in manufacturing. So, CPS and IoT are de facto more than twins. A key component of the Industrial Internet of Things is connectivity. According to research, industrial manufacturers still have some catching up to do in regards with connectivity overall. Among others, the adoption of cloud-based services and the connection of legacy systems to digital networks is lagging somewhat behind. Yet, as IIoT strategies are being envisioned and designed, the number of Industrial Internet of Things connections is growing rapidly and changes occur in the types of connectivity solutions that are used. In 2017 research from ABI Research, it is estimated that in 2017 there will be 13 million extra (new) wireline and wirelines connections across the globe. In total this would bring the number of Industrial IoT connections to 66 million. In the years after, this growth continues and even accelerates (18 million new connections per year by 2021). Looking at the various types of Industrial IoT connection connection solutions in manufacturing and thus Industry 4.0, it is expected that revenues from cellular and satellite connectivity fees will reach more than $138 million in 2017. The major part of connections consists of fixed line deployments but wireless is growing and will account for approximately a quarter of all new connections in 2017. Moreover, on the longer term it is expected that LPWA will be the fastest grower and that the shift to 4G LTE continues. Research Director Jeff Orr points out that with the lowering costs in storage and processing, Industry 4.0 comes in reach of all manufacturers. With the evolutions in the connectivity options and solutions in that crucial component of Industry 4.0, which the Industrial Internet of Things is, this is even more the case. While, as mentioned the Industrial Internet Consortium has a framework, called IIRA (Industrial Internet Reference Architecture), German ‘Plattform Industrie 4.0’ developed the so-called Reference Architectural Model Industrie 4.0 (RAMI 4.0). RAMI 4.0, although originating from Germany, just as Industrie 4.0, is playing an increasing role in other countries as well. As a matter of fact, ‘Platfform Industrie 4.0’ is seeking alignment at European levels and with other countries across the globe. Even if some EU countries use different terms such as intelligent factory, future industry, digital production or smart manufacturing, the European Commission (EC) is also intervening. Early 2017, a forum was held in the scope of the EC’s ‘Digitizing European Industry’ project. Industry 4.0 and RAMI 4.0 are also clearly mentioned within various programs on the website of the EC (and a PDF with the essence of the Reference Architectural Model Industrie 4.0 is available on it, not without reason). At the mentioned forum, the so-called ‘Stakeholder Forum’, held early 2017, international collaboration around Industry 4.0 was one of the topics. ‘Plattform Industrie 4.0’ used the occasion to further expand bilateral relationships with, among others the French Industry of the Future Alliance (Alliance Industrie du Futur) and Italy’s Intelligent Factory project (Fabbrica Intelligente). Outside of the EU, partners include the mentioned IIC (Industrial Internet Consortium) and Japan’s Robot Revolution Initiative (meanwhile, Japan announced its all-encompassing Society 5.0 initiative at the CeBIT 2017 tradeshow). An overview of the ongoing acceptance and leverage of Industrie 4.0 technologies, concepts and principles, as mentioned previously, at the bottom of this page with over a dozen Industry 4.0 initiatives across the globe. If you are looking for some examples of Industry 4.0 cases in practice, it’s probably interesting to know that you can watch a map, translated in English by ‘Platfform Industrie 4.0’, right before the forum. Click on a place on the map and read more about the specific case (for now only German examples). What are some of the key aspects you need to know about RAMI 4.0 (the architectural model overviewis embedded below)? First, know that there are two documents which laid out the foundations of Industry 4.0 and RAMI 4.0. Horizontal integration across value-added networks. The consistency of engineering across the entire value chain. The new social infrastructures of labor/work. We mention these topics of that first document as we’ll tackle them more in depth. The second document, the “Umsetzungsstrategie”, a document with the recommendations for the strategic translation and implementation of Industry 4.0, was published in 2015 and contains the RAMI 4.0 model, the Industry 4.0 components and a research roadmap for implementation. It’s this document and more specifically, RAMI 4.0 AND the Industry 4.0 components which we tackle here. The first dimension consists of the hierarchy levels. The second dimension covers the life cycle and value stream. The third and final dimension covers the so-called RAMI (architecture) layers. The hierarchy dimension consists of 7 aggregation levels, being 1) the connected world, 2) the enterprise, 3) work centers, 4) stations (or machines), 5) control devices, 6) field devices (sensor and actuators) and 7) products. Important to note: while traditionally these levels are seen as a “real hierarchy” and depicted as a pyramid, in Industry 4.0 they are more conceived and depicted as a mesh in a reality of ubiquitous connectivity of everything, including processes, devices, products, organizations, ecosystems and so forth. In the pyramid that shows Industry 3.0 there are only 6 levels with the enterprise at the top. While it’s true that the connected world is far more connected from a technology and business perspective, we must point out that there is such a thing as the extended enterprise with its ecosystems since long before anyone even talked about Industry 4.0. The hierarchy dimension is what we covered several times in our articles on ubiquitous connectivity and digital transformation but in a different scope of hierarchy with smart products and smart factories as part of this connected world. It also about technologies (where we similar decentralizations all across the board) (IT and especially OT) and about the ubiquitous interaction of participants across hierarchy levels, whereby the product is seen as part of the network. 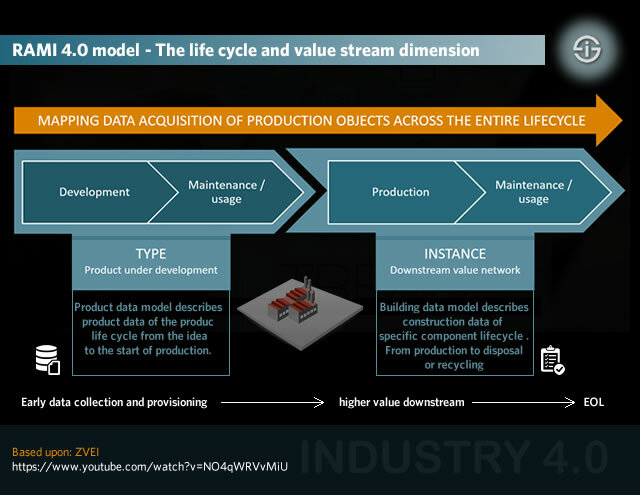 The life cycle and value stream dimension, as the term already describes, covers the various data mapping stages across relevant life cycles in RAMI 4.0 and across the entire value chain and the various processes (and stakeholders). We’ll cover this more in depth later as it’s key in the data part, starting from the pre-production development product data model, starting at the idea and development (data on, among others, , all the way across further stages downstream, including actual production and the various processes until the production object is end of life and gets recycled or trashed). The idea: the more data early on, the more value later on. The third dimension, the architecture layers, consists of 6 components: business, functional, information(a), communication, integration and asset. Essentially we’re talking about 1) the enterprise and its business processes, 2) the functions of assets, 3) the required data, 4) communication as access to information, 5) integration as, quote, ‘transition from real to digital world and 6) assets as physical things in the real world. Bring all three dimensions together and, on top of a nice visual, you have a 3D service-oriented architecture. If you want to know more about the Reference Architectural Model Industrie 4.0 check out the curated list of RAMI 4.0 sources below. After this introduction to RAMI 4.0, which as mentioned was laid out in the 2015 document with recommendations for Industry 4.0 strategies and implementations, let’s take a look at some other so-called Industry 4.0 principles. These were established in the 2013 report in which the Industrie 4.0 workgroups presented their findings on, among others those principles and foundations. Remember that, as mentioned and as we’ll cover more in depth, those recommendations, principles and so forth mainly were about manufacturing but that de facto Industry 4.0, its principles, vision and elements are going beyond manufacturing – and will continue to do so as Industry 4.0 moves from vision to reality in meeting the inevitable transformation of other industries as they are already taking place today. Despite the fact that there is a difference between horizontal and vertical integration the goal is the same: ecosystem-wide data information between various systems and across all processes, using data transfer standards and creating the basis for an automated supply and value chain. Horizontal integration refers to the integration of IT systems for and across the various production and business planning processes. In-between these various processes there are flows of materials, energy and information. Moreover, they concern both the internal as external (partners, suppliers, customers but also other ecosystem members, from logistics to innovation) flows and stakeholders. In other words: horizontal integration is about digitization across the full value and supply chain, whereby data exchanges and connected information systems take center stage. As you can imagine this is not a small task. For starters, within organizations there are still quite some disconnected IT systems. This is a challenge for all organizations, industrial or not. If you start looking at seamless integration and data exchange with suppliers, customers and other external stakeholders, the picture becomes even more complex. Also keep in mind the life cycle and value stream dimension of RAMI 4.0 here where we talked about the importance of early data collection and provisioning. Whether it concerns product data or information about the various mentioned and other processes across the horizontal value chain (so, the path from supplier and production to end customer and/or other stakeholders/partners), there is still quite some work to do in this regard. Nevertheless, it is critical for Industry 4.0 and for business overall. The benefits and drivers for this need for horizontally connected information systems are pretty comparable to those we find in information management, as are the disadvantages if systems are not integrated. We’re talking about customer service and satisfaction (with many customers in supply chains), planning, employee productivity and satisfaction, speed and so forth. Compare it with information management challenges in an insurance scenario: if back-office information on, for instance a claims process, is not connected with the front end, customer service agents can’t help the customer fast enough if he/she seeks information or help on the (status) of the process. It’s exactly the same in Industry 4.0 and manufacturing. We’re just talking about more stakeholders, highly interdependent processes and stakeholders, far more processes and data and so forth. It’s a no-brainer that horizontal integration helps with horizontal coordination, collaboration, cost savings, value creation, speed (as an enabler of smooth service and operations but also of faster time to market and worker’s efficiency) and the possibilities to create horizontal ecosystems of value, based on information. However, it’s not because it’s a no-brainer that it’s easy. Ask any organization in any industry. Last but not least: we’re not just talking about information. It’s the knowledge, insights and action which matter in the end. Whereas horizontal integration is about IT systems and flows in the supply/value chain and the various processes happening across it, vertical integration has a hierarchical level component. In other words: it’s about the integration of IT systems at various hierarchical production and manufacturing levels, rather than horizontal levels, into one comprehensive solution. These hierarchical level are respectively the field level (interfacing with the production process via sensors and actuators), the control level (regulation of both machines and systems), the process line level or actual production process level (that needs to be monitored and controlled), the operations level (production planning, quality management and so forth) and the enterprise planning level (order management and processing, the bigger overall production planning etc). Typical solutions and technologies in this vertical integration include PLCs which control manufacturing processes and sit on the control level, SCADA which enables various production process level and supervisory tasks and is de facto commonly used in industrial control systems, MES or manufacturing execution systems for the management level and intelligent ERP for the enterprise level, which is the highest level in this hierarchical picture. As mentioned previously, the MES (manufacturing execution system) plays a central role in the first stages of Industry 4.0 transformation as the digital hub of information and connectivity. As mentioned previously the opportunities which are offered by Industry 4.0 stretch beyond goals of automation, higher efficiency and so forth. As the people behind Industrie 4.0 say themselves the true opportunities reside in the identification and implementation of new business models. Although that is easier said than done (for many companies reaching these stages and goals is a virtually impossible task, certainly now, one of the reasons why they mainly focus on a staged approach or smaller steps as you can read in our article on industrial transformation), it is the true goal: new business models based on data, new ecosystems and new ways to service customers, meet demands in novel ways and create new revenue streams. These more aspirational goals of industrial transformation mainly revolve around the service dimension of the so-called automation pyramid. Below is a nice example of such an automation pyramid, courtesy of the people at invilution. Indeed, it looks like the vertical integration image above. It’s not as if the people behind Industry 4.0 invented everything, right? What we do have now is the growing importance of the Internet of Things. And Industry 4.0 is of course a lot about IT entering a world of OT in combination with IoT and convergence between IT and OT. And, yes, it also looks a bit like the DIKW pyramid, a model that has existed forever to show the path from data to information to knowledge to wisdom (and in some depictions to action), in the end it is all very much related. That automation pyramid is really just a depiction of the implementation of Industry 4.0 in the organization and will not just look familiar to people who have been active in industrial automation forever but will also seem familiar to many who have already looked at the strategical aspects of Industrial Iot strategies. The automation pyramid for the implementation of Industry 4.0 we are going to look at from a transformation perspective (call it an industrial transformation pyramid) consists of 4 levels. Do also think about the layers of network models such as OSI and others when looking at them as obviously there is a technological dimension and IT and IoT people will – of course – recognize a lot too. Just as other aspects of Industry 4.0 such as vertical integration and horizontal integration, essentially we are talking about data, starting from connected assets, all the way up to the services built upon the identification of assets with sensors and systems which carry information that gets analyzed and send across networks to other platforms where the new services are built upon. If you ever happened to see this simply automation pyramid you’ll notice we’ve adapted it a bit as the dimension of ecosystems for the deployment of new services lacked a bit (more below). The first layer of the automation pyramid concerns sensors and actuators. In an Internet of Things context we would say the ‘things and device’ layer although here you can imagine other technologies and systems as well. The first layer essentially consists of product and manufacturing assets and components which become information carriers as they can be addressed, localized and identified through sensors and are connected. Pretty much the foundation of IoT indeed: connect what needs to be connected to ‘sense’ what needs to be ‘sensed’, bridge digital and physical and lay the foundation for the next levels. Built upon that connected layer of sensors, actuators and essentially data sits a layer of services and systems that enables the new ways in which the value chain is organized and managed. Here we meet applications such as energy monitoring and the monitoring and management of systems and conditions of assets such as machines, buildings, infrastructure and so forth. In other words: mainly monitoring and managing, albeit it with the next step in mind: we do monitor for a reason – to enhance, understand and build new capabilities. Although it’s more part of the third level you can imagine applications here whereby you can for instance find ways to monetize based upon performance. Adding the additional layer of connectivity whereby not just assets are connected but also the data and monitoring systems we then come to IoT and IP service models that enable smarter applications and new capabilities such as preventive/predictive maintenance, asset tracking and so forth whereby there is already a change in business approach for many organizations. Initially these maintenance, tracking and other applications are often focusing on internal operations but of course some can become additional revenue sources when deployed and offered in a customer ecosystem context, for example by offering maintenance contracts that could bring in new revenues or be offered as a service with the equipment you sell, while lowering costs for yourself (service and support) and your customers (less downtime). The fourth layer, finally, is where you can leverage the capabilities and services and data/intelligence you have to really transform your business model with myriad services, depending on the context. These could range from applications enabling consumers to tailor the goods they order and sell advanced services to come up with new revenue streams, certainly when developing services within ecosystems of data and possible partners. It’s also here that you can start developing new services that mean a significant shift in your core business by aggregating data and intelligence from your intelligent systems and those of others with complementary systems and tapping into entirely new customer segments. And it’s also here that we see industrial IoT data exchanges and monetization platforms. In this stage it’s not that much the technology that limits what you can do but your vision and imagination. But again, it looks easier than it is in practice of course. Going from less paper and legacy systems to simply connecting assets and leveraging IoT, bridging IT and OT integration challenges in the first layer and being able to monitor and manage whatever needs to be monitored and managed, from energy to structures and beyond is already a huge step for many. Industry 4.0 is often resumed in six so-called design principles, essentially serving as part of the Industry 4.0 vision and to make the guidelines clearer for companies who want to understand, identify and implement Industry 4.0 projects. There has been an awful lot of academic work into those design principles so you might find other terms and potentially four instead of six design principles. In essence they are relatively simple – and should allow to explain what Industry 4.0 in the end means to. These relatively well-known Industry 4.0 design principles are 1) Interoperability (now and then also referred to as interconnection or simply connectivity), 2) information transparency (also virtualization or virtual entities), 3) decentralization (also decentralized/autonomous decisions or autonomy), 4) real-time capability, 5) technical assistance and service orientation (with Human-Machine Interaction) and 6) modularity. A look at these Industry 4.0 design principles in a bit more detail. In order to move to intelligent manufacturing, smart factories, or connected industries, you need to bridge things such as real things, people, standards, work processes (man and machine) and more. And to bridge all that you need data and networks. They must all inter-operate and inter-connect. You need to bridge IT and OT, you need to have assets such as machines that can connect and communicate thanks to sensors and other equipment and you need to connect people, data, machines and so on. This is indeed mainly about the Internet of Things and, in a broader perspective an Internet of Services, Internet of People, Services and Things, Internet of Everything, whatever name you prefer. Interoperability is also about collaboration, the ability to have many (really many) standards talk to each other so data from various sources can be leveraged (why we use Industrial IoT gateways, IoT platforms and talk about IT and OT integration, which goes beyond technology and is about human collaboration too, namely IT and OT teams). Interoperability means connected devices, connected communication technologies, connected people, connected data, people connected and collaborating with machines, machines working with machines, an interoperable unified and holistic information, security and data layer and so forth. Inter-operating and inter-connecting and in more than one sense connected with vertical and horizontal integration. Information transparency (or virtualization) might be a bit harder to explain to a friend as it is not about the transparency of information. Information transparency essentially is the capability of information systems and cyber-physical systems to simulate and create virtual copies of physical world elements through the creation of digital models that are fed by all this data you get through sensors and inter-operating and inter-operable ‘things’. Without interoperability, information transparency and virtualization are not possible as the information needs to be put in context and systems are context-aware, combining information from other sources too. In the cyber-physical lingo of Industry 4.0 you could say that you need information from the cyber environment (virtual, digital) and the physical environments (aware of context in space and place). Finally do note that we speak about context-aware information. This essentially means two things: 1) information is not data, remember the DIKW model so analytics and moving from data to information and so forth is key here and 2) context-aware also means that the information can differ, depending on not just the actual context in which it is gathered and enriched but also in the context of its scope which can mean real-time information and so forth. The easier way to explain it to a friend is probably to say that there is a virtual copy for pretty much everything. As mentioned earlier one of the core goals of Industry 4.0 is to bring autonomy and autonomous decisions to machines and cyber-physical systems. Only then the agility and flexibility needed to be able to deal with uncertainties, respond to demands of personalization, the concept of the smart factory and its place in an inter-connected ecosystem, the required data analytics and the various logistics can be enhanced, meeting the need for speed. We tackled this aspect of autonomy and (semi-)autonomous decisions and intelligence more in depth in our article on Logistics 4.0. Decentralization is not just a given in Industry 4.0 and Logistics 4.0, it is pretty ubiquitous: the Internet of Things, fog and edge computing, intelligence moving to the edge across myriad applications, including building automation, blockchain, the list goes on. In fact, the IoT de facto is a decentralized given as such. We are talking about a distributed reality. However, in the scope of Industry 4.0 and Logistics 4.0 it essentially depicts the movement to phenomena in autonomous production systems, autonomous decisions in warehousing (smart shelves, cobots,…) and in myriad other aspects and applications (self-driving vehicles, shutting controls off or switching them on, taking decisions in production, predictive maintenance, you name it). Decentralized and autonomous decisions are not just key in the technologies and cyber-physical systems of Industry 4.0 but also in the human aspects as not all decisions can be fully automated and human planning, interpretation and decisions are still key and in many cases there is a mix of semi-autonomous capabilities in collaboration with people (e.g. collaborative robots). The end of the discussion on decentralization and autonomy is far from over, certainly from the human and decision-making perspective. In Industry 4.0 the mantra has been to only let decisions go to ‘higher levels’ in case of issues and so forth. However, in practice this is not always achievable, let alone desirable. If you strive towards more autonomy on the machine and cyber-physical system level you do so for increased efficiency and to meet the demands of an increasingly real-time economy. Advanced analytics, the IoT and the information and production systems in a smart manufacturing environment in its broader context of collaboration and ecosystems already are all about the development of real-time capabilities. So, it’s only logical that on the level of data, turning it into actionable intelligence and actions/decisions and on the level of the processes and functioning of the overall manufacturing, logistics and ‘smart factory’ operations there is a need for a real-time capability. Flexibility, predictive maintenance, being able to quickly replace assets in case of failures and the IoT all are important in this perspective which also touches the previously mentioned design principles and the data to decision aspects tackled previously. Moreover, a real-time capability is essential for the last two design principles, service orientation and modularity. The service orientation is related with the as-a-service economy, the Internet of Services and the obvious fact that manufacturing needs to be more tailored to the demand of customers for services and products with value added services (e.g. personalization) instead of what the company decides to produce. In a sense it’s transforming manufacturing in a scope of customer-centricity and evolving customer demands. Yet, the service orientation is also related with the need for manufacturers and other industries to develop new services that are de facto based upon data, turned into intelligence, and seek new service-based revenue models. Moreover, technical assistance and, more specifically maintenance, is a core principle as IoT and data analytics simply allow the transformation of services and maintenance. There are plenty of companies who changed their service models by simply adding levels of intelligence and connectivity with IoT to the equipment they sell. Assistance systems must also serve the ‘internal customers’: all possible workers who need to be able to take decisions, where the changing skillsets also come in, supported by several systems that enable them to do so. And here we also meet Human-Machine Interaction. Finally, the service aspect is also related with the development of new as-a-service-models based upon data but also based upon the evolution towards a Machines as a Service model. Modularity means many things, depending on how you look at it: the various individual modules within the broad smart factory environment or simply as the end result when it becomes agility and flexibility. We’ve covered this before in, among others, the scope of flexibility and agility from the perspective of customer demand, being able to plan for the unpredictable and the increasing demand for personalization. You could say that modularity has everything to do with a shift from rigid systems, inflexible models and linear manufacturing and planning to an environment where changing demands from customers, partners in the overall supply chain, regulators, market conditions and all other possible elements causing the need for transformation and flexibility are put in the center. The modules are locally controlled without hierarchy. Previously in this overview of Industry 4.0 we touched upon several technologies. If you look at the presentation and data from the Boston Consulting Group, you’ll see some of the main technologies in Industrie 4.0. 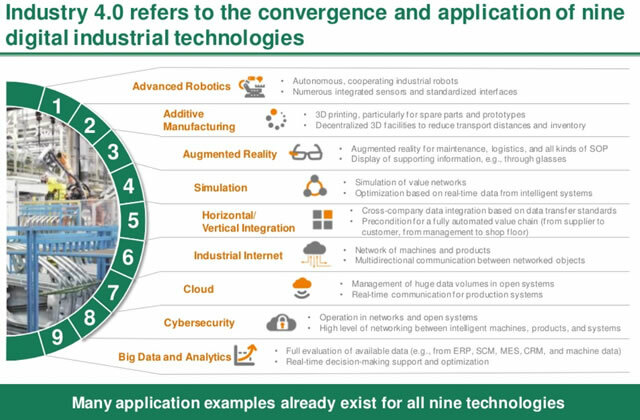 As a reminder: BCG mentions advanced robotics, additive manufacturing, augmented reality, simulation, horizontal/vertical integration, the Industrial Internet (of Things), cloud, cybersecurity and, finally Big Data and Analytics. Most of them are really umbrella terms for several technologies. We already tackled horizontal and vertical integration, cyber-physical systems and the Industrial Internet of Things as really vast realities with many technologies and components before on this page (and elsewhere). We also have literally dozens of articles on other evolutions in the mentioned convergence and application of nine digital industrial technologies as BCG calls them. Yet, instead of sending you to other pages and taking into account the specific aspects of some technologies in an industrial scope we’ll zoom in on a few more which are rather typical in manufacturing and industrial markets. Those that are less typical (with typical ones being the integration of IT and OT, additive manufacturing, industrial robots and so forth) are probably the ones you are looking at today: IoT, Big Data, the cloud, maybe 3D-printing etc. They are the technologies that we meet in IDC’s so-called third platform with transformational pillars and innovation accelerators. So, what technologies are really key to Industry 4.0? It depends but the Internet of Things is clearly critical as it is what makes most so-called Industry 4.0 levers (see below) possible. Security is also an inherent part of the Industrie 4.0 vision. In fact, most of the mentioned technologies are essential as they are inevitably connected and interdependent. So, where do we start? The best way to start is by looking at your goals and challenges and at the capabilities you need on your Industry 4.0 journey. Big Data, analytics, the cloud (and the fog), AI and simulation, to name a few, are about the adaptability, flexibility, modularity, scalability and rapid deployment and integration capabilities that we want to see with Industry 4.0. These capabilities come back in many of the Industry 4.0 resources we previously listed (such as Gartner’s page) and are also means to an end. Do note that several consulting firms and analysts zoom in on other digital technologies as enablers of Industry 4.0. Mobile devices and technologies are just one example. More advanced interfaces in the relationship between human and machine are another (or better: new interfaces in the relationship between human and technologies as machines makes us overlooks the critical software dimension in a world where software as they say is eating that world. Think artificial intelligence agents and bots or in another context phenomena such as Robotic Process Automation or RPA). Obviously you can’t implement all technologies at once, nor should you. We looked at the strategic dimension of Industry 4.0 before and will continue to focus on it. If you want to have a more value-oriented and purpose-driven view at the technological journey, you might want to check out the so-called digital compass which McKinsey made a few years ago, especially the value drivers in it. For the many organizations who are still in the beginning of their Industry 4.0 journey it might look a bit overwhelming but when you look closer it isn’t. At the center are the value drivers which we all know and touch upon 8 areas/dimensions: time to market, matching supply and demand, quality, inventories, labor, asset utilization, resource/process and service/aftersales. So, these are really some main areas where, in the scope of that compass, you could create more value towards one or more stakeholders at the same time. Because obviously, it’s not just about these 8 dimensions as such but about the question how you can improve the various processes and experiences of those involved with a clear connection to tangible value. The second part of the compass shows the Industry 4.0 levers which are connected with the value drivers. As an example: in order to better utilize your assets, remote monitoring and control and predictive maintenance can help you achieve that goal. From a technology perspective, it’s a matter of knowing what technologies are needed to ‘do’ remote monitoring/control and/or predictive maintenance and it’s here that we start looking at technologies such as Big Data analytics and of course the Internet of Things as you can’t get data from your assets for monitoring/maintenance purposes if they aren’t connected with the purpose of doing so. Although companies such as McKinsey and many others are absolute leaders in Industry 4.0 it remains important to start from your individual goals and means to achieve them, after having conducting analysis and drafting a plan and roadmap that serves your business. In that sense we say the exact same thing regarding Industry 4.0 as we did about digital transformation: the technologies are enablers and there is far more to look at. While that might sound like common business sense it is often forgotten. So, be careful with an overemphasis on ‘the technologies you really should have’ and also be careful with the many models, frameworks and compasses out there. The reality of Industry 4.0 ad of supply chains looks like a big complex mesh with loads of moving connections, nodes and dimensions if you try to visualize it. Yet, technologies and Industry 4.0 are about reducing our complexity and that of our processes, partners, customers and supply chains in a prioritized and staged way. It’s in this exercise of looking at our complexity that the capabilities are built to innovate and develop capabilities and flexibility, which in the end are mainly about dealing with and removing complexity with novel approaches for our various stakeholders by tapping into the opportunities we detect in a complex reality. And that requires a different approach for each organization, even if there are many common lessons and strategies we can learn from. Yet, there is never a one size fits all. Take a look again at the digital compass of McKinsey, for example. You might want to improve customer service; the dark green part of the compass. But that doesn’t mean that predictive maintenance, remote maintenance and virtually guided self-service are the solutions to make it happen. The labor part, for example, is also key in customer service. And so is the inventories piece. And what about time to market and quality? Or the flexibility in utilizing your assets. They all play a role in better servicing the customer. The ways that work best for your customers and your business depend on how all these levers and all the other service aspects that aren’t necessarily even mentioned as they’re not part of that Industry 4.0 compass, interact, what your customers want and who they are today and could be tomorrow. That’s why Industry 4.0, just like digital transformation, is by definition a holistic given and can’t be captured in an illustration, whether it’s one we made, McKinsey’s digital compass or any framework out there. Take them for what they are: instruments and compasses to think about dealing with complexity and offering ideas or approaches which we can leverage in our own, increasingly digital, reality of challenges and opportunities, in which industrial transformation and technologies fit. On a level of manufacturing (and supply chain management) technology in the sense of operational technologies and traditional manufacturing technologies it is clear that a lot is happening as well, enabled by information technology (IP, analytics and AI, for instance), IoT, scientific research and innovations and technological innovations on virtually all levels. Who would have ever thought that one day there would be a tool holder which enables the collection of data from the machining processes which then get sent to a dashboard to provide insights into what’s happening inside slender tubular components to an operator? Who would have ever though that a company like Airbus one day would have an aviation data platform and commercialize it? The thing with all the technological evolutions in Industry 4.0 is that it goes in all directions. And it doesn’t matter if it’s called IT or OT. According to IDC’s manufacturing predictions for 2018 and beyond, for example, we are moving from an ERP to an intelligent ERP whereby embedded intelligence forms the backbone to automate large-scale processes and speed up execution times by up to 25 percent. That – secure – backbone is poised to integrate IoT, cognitive (artificial intelligence and machine learning) and even blockchain technology and by 2021 a fifth of the largest (Global 2000) manufacturers would depend on it. Next generation presses and tooling equipment, evolutions in Manufacturing Execution Systems, new CAD and CAM applications, shaping materials, digital platforms and industry clouds, smart assets, customer-driven design possibilities through virtual reality, crowdsourcing and product virtualization, the list of what is changing and yet to come is long. However, as per usual not everything will be relevant for everyone. More about the mentioned predictions and the evolutions in operational technology and industrial technologies used in manufacturing, in combination with IT via the button below. Although we often mentioned the traditional image of the automation pyramid (just as we like to keep referring to the DIKW model to explain things) with its nicely and easy looking hierarchical levels taking center stage in the vertical integration of Industry 4.0, at the same time it is crystal clear that this pyramid and mainly what’s behind its various levels is disrupted. While for many companies Industry 4.0 and Industrial IoT are far from a reality yet, the preparations to move in industrial transformation have an impact on hardware, software, technologies, processes and the integration, connectivity and interoperability of it all. Just as the borders between the various technologies and the various levels of our traditional automation pyramid are blurring, so are the data, communication and system silos. With the move to the cloud, the increasing importance of IoT and the need to connect systems with the proper newer technologies which we see in Industry 4.0 and in the third platform and its innovation accelerators, the solutions landscape is changing in the ongoing integration of IT and OT. It comes with many challenges, on the level of value creation, connected data and security, to name a few. However, one needs to start somewhere. And often one starts at the edge, of the business and of the technology stack. Keeping in mind the traditional automation pyramid that’s where sensors, actuators and cyber-physical systems sit and meet the PLC control level. It’s here and in SCADA systems that the journey starts as everything becomes integrated, or better, interconnected with increasingly modular approaches. From a perspective of the vendors of software alone this is also a challenge for many. Manufacturing execution systems and SCADA systems, to name just two, exist since a long time and aren’t designed for the mentioned evolutions. It often leads to a bolt-on approach which customers really don’t want. Radical architectural changes and evolutions in ERP software, manufacturing execution systems, SCADA systems and even the ‘lower’ levels are inevitable. On the longer run they even go far beyond the ‘platform’ and ‘service-oriented’ models most can imagine today. The example of ERP moving to intelligent ERP with AI, IoT and blockchain is a perfect illustration for this. As said, for many organizations blockchain is still something they never heard about or know from the virtual currency perspective alone. With edge computing, and again AI, other applications in the broader picture of manufacturing operations is becoming one of many uncertainties about the long-term future of SCADA, MES and so on. Do expect a landscape in which it’s not the plant floor that matters nor even the plant alone. It’s the whole value chain, including an increasing need for multi-plant orchestration, smart supply chain management and service-oriented approaches whereby functions are services and in the end we move to intelligent pieces that seamlessly interconnect on all levels. Think about the previously mentioned design principles of Industry 4.0: interoperability, virtualization, decentralization, real-time capabilities, a service-oriented approach and modularity. They all play in the radically changing architectures of the various solutions that exist. A quick look at some of the evolutions in the top 3 levels of our classic automation pyramid which is starting to look like a mesh as systems start speaking the same languages of industrial protocols and IIoT. On the ERP level there is the previously mentioned evolution towards ERP with a key role for artificial intelligence which will be injected in all applications for that matter, without one even knowing it. Leveraging blockchain, machine learning, advanced analytics and so forth to essentially take care of all transactional, contractual, administrative, predictive, autonomous, analysis and far more aspects of all the data that is still to be unlocked intelligent ERP is poised to lead to unseen levels of process automation and speed with a focus on outcomes. It is indeed something else than ERP as Excel Runs Production. On the level of manufacturing execution systems we’ve already started to move away from traditional monolithic legacy systems of record but here as well a lot is poised to change. Think again artificial intelligence and machine learning, increasing autonomy, the previously mentioned move towards a service-oriented and modular service approach, more integrations with even more systems than is already the cases and MES functions in embedded systems with a far more end-to-end approach beyond the plant floor, let alone the individual plant. Finally there is SCADA. As previously mentioned SCADA systems for now remain an important step on the level of operability and is seen as critical to connect distributed assets, as per usual to generate actionable intelligence. Although on the short to medium term there is an acceptance that Industrial IoT and SCADA will remain or become good friends as there are ample situations where SCADA is needed today, on the longer term SCADA will probably disappear as security, intelligence and functionality in ERP, in PLC and in IoT will only increase on all levels. There are very few arguments for SCADA which continue to remain relevant in the scope of overall IoT and technology evolutions on the long run. Yet, it isn’t for tomorrow. What will first change is the HMI/SCADA software and overall HMI layer as ample new technologies enable ample new human machine interface experiences. However, here, as well as in all the other mentioned levels there is still a long way to go, not in the least on the level of SCADA/HMI security issues. The goals of Industry 4.0 are pretty clear. Getting there is another ball game. Maybe we’ll even never fully get there, no one has a crystal ball. Yet in the mean time for some it’s still getting rid of paper, for others it’s catching up and for a few it’s moving towards innovation and what in the end it is all about: the actual outcomes which by definition are human. And whether all the mentioned dramatic changes in software and systems, in processes and ways of optimizing, automating, creating value and changing experiences will fully take place in the end is also a human matter. Because here is the simple thing: it’s not the actionable intelligence nor the connection of actionable intelligence with even more connections and multiplied intelligence that matters, it’s what you use it for and do with it. As we mentioned in the introduction of our article and in the scope of the RAMI 4.0 reference architecture model for Industrie 4.0, the Industry 4.0 view and concept has clearly gone global and continues to do so. In the US, Industry 4.0 is de facto having an important impact on smart manufacturing initiatives and there is the collaboration with the Industrial Internet Consortium. Moreover, there is an increasing number of organizations and countries where Industry 4.0 is becoming adopted. Examples include the UK (Industry 4.0 and the work around 4IR, short for 4th industrial revolution by the EEF), Japan (where there is, as mentioned already a collaboration with Japan’s Robot Revolution Initiative), China (where the Industry 4.0 outline is at the basis of ‘Made in China 2025’) and the numerous EU initiatives of which we mentioned some previously. On March 23rd 2017, the EU alone looked at plans to align the already 12 existing and 9 coming national industry transformation initiatives. Essentially all of them are leveraging the Industry 4.0 concept, regardless of their many different names. However, the global expansion of Industrie 4.0 is not just a matter of government initiatives or agreements. It is also a result of an increasing focus among industrial giants and leading consulting firms on Industry 4.0. From PwC and Accenture to McKinsey; they’re all heavily involved in Industrie 4.0. One example of an industrial giant, from outside the EU, that is heavily involved in Industrie 4.0 is Infosys that supported the plans of the German Academy of Science and Engineering, Acatech (which coined the term Industrie 4.0), to create an Industrie 4.0 Maturity Index. The consortium which was created in the Spring of 2016 to get the Industry 4.0 Maturity Index ready by April 2017, includes research institutions and several industry bodies, as well as companies such as Infosys. Expect a range of announcements and partnerships to further drive the Industry 4.0 concept further across the globe. Last but not least, also remember that we’re not just seeing a global/regional expansion of Industry 4.0: there is also an increasing adoption of Industry 4.0 principles and technologies across vertical markets beyond manufacturing (healthcare, utilities, smart cities, oil and gas etc.). Various research organizations, with a leading role for the Fraunhofer Institute, and the German government are pushing a reference architecture model and virtual construct for secure data sharing based on standardized communication interfaces. That is a mouthful to say that Industrial Data Space, which aims to define the data architecture for the connection of smart services and IoT in a landscape of ever more data wants to become a global standard. Industrial Data Space focuses on the connection of several existing platforms and wants to enable partners to share data for digital transformation purposes within a clear pre-defined model whereby data sovereignty and data security are among the key focus areas. The Industrial Data Space Association is conducting talks with other organizations with similar architecture frameworks, countries outside Germany and the EU in the scope of the movement towards a European Data Space. Although there is an important focus on Industry 4.0, the Industrial Data Space stretches across other industries as well. 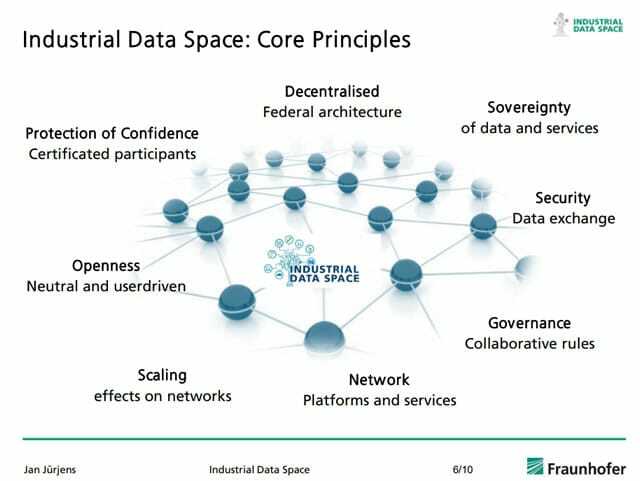 The illustration below from the presentation of Prof. Dr. Jan Jürjens on the website of the EU (which can be downloaded in PDF here) shows some of the core principles of Industrial Data Space. The fourth industrial revolution needs to be powered. Yet, the sources of power and how we leverage them inside industrial settings are changing. Energy efficiency and power management are simply inherent to Industry 4.0. The focus on ecology, cost savings, changing regulations, the sheer possibility to create, combine, measure and optimize in entirely new ways, using pervasive metering, sensors, IoT and data analytics, the list goes on. Moreover the energy sector as such goes through its digital transformation, also known as Energy 4.0. And obviously there is the need for maintenance and asset management, the increasing emphasis on continuity and productivity in a real-time economy, whereby systems can’t fail and power availability and reliability are essential, and the reality of the connection of new power sources. This also goes for the power critical facilities and buildings in Industry 4.0, from airports to factories and other buildings where energy efficiency and Industry 4.0 go hand in hand. Below are some more articles on our website which tackle aspects, components and evolutions that are relevant for Industry 4.0. Click the headlines for the desired article. Industry 4.0, although having expanded to other industries is still primarily a matter of the manufacturing industry. In this article on the digital transformation and digitization of manufacturing we tackle the evolutions, challenges and accelerators and look into research and data for 2017 and beyond with a worldwide focus. Industry 4.0 and industrial digital transformation overall have a strong impact on the organization, human dimensions, technological evolutions and even disruptions in logistics and supply chain management or SCM. We looked at some aspects of what is also called Logistics 4.0 earlier and in previously mentioned articles with regards to the rise of cobots in Logistics 4.0, IoT, cloud and advanced data analytics as drivers of connected logistics and the digital transformation of logistics and transportation overall. Yet, how is logistics and supply chain management evolving in Industry 4.0? A key evolution is the movement of autonomous and semi-autonomous intelligence and decisions to various areas of logistics and the edge. Smart trucks, self-driving vehicles, smart containers, they are all part of this transformation. Yet, the human, organizational and transformational impact of Industry 4.0 on logistics and SCM goes further than that as covered in this article. Manufacturing companies in the UK feel prepared for Industry 4.0. However, on top of traditional barriers to move in the journey towards Industrie 4.0, the UK also has specific challenges, including the need for a more industry-wide plan and readiness strategies. Associations such as the EEF are helping manufacturers to take that journey of what is called 4IR in the UK (4th industrial revolution) . End January 2017 the Industrial Digitalisation Review team in the UK was asked by the UK government to draft a document to support the government’s industrial strategy. It resulted in the impressive Made Smarter Review that has a strategy striving to put the country in a leadership position in industrial digitalization. In March 2017, the EU announced a series of initiatives to boost Industry 4.0 across the European Union. In this article we look at, among others, the spending plans, the several national initiatives in the EU and in the UK and the creation of a European platform. Industry 4.0 initiatives are ubiquitous in EU member states and beyond. With a central role for the Industrial Internet of Things, US manufacturing giant GE (General Electric) developed what it called the Industrial Internet. Along with several other leading companies, universities, consulting firms and so forth the Industrial Internet Consortium or IIC was launched. This large association includes many US organizations but also companies from across the globe, including from Germany. The Industrial Internet Consortium works together with other associations and with the Industry 4.0 Platform as both have similar goals. This includes collaborations on standards and frameworks. In this article you learn more about Industrial Internet and the Consortium. Japan has its own industrial revolution and collaborates with the Industry 4.0 platform. In March 2017, however, Japan announced a far-reaching program that aims to go far beyond the transformation of manufacturing and any other industry. Society 5.0 includes Industry 4.0 but touches upon Japanese society in the broadest possible sense, including culture, legislation and even philosophy. An overview of research, conducted in 2015, about the state of Industry 4.0 across the globe. In this article we look at the research’s findings, which cover China, the US, the UK, France and Germany, as well as the Industrie 4.0 Maturity Index which builds upon it, was announced in 2016 and is available since April 2017. As Industry 4.0 is going global, initiatives are taken to enable manufacturers to learn about Industry 4.0 in a practical way. One of those initiatives, launched in March 2017, is the creation of a network of so-called Digital Capability Centers (DCCs) by McKinsey, academic institutions and companies such as PTC whereby a realistic factory environment serves as a showcase and test environment. There are Industry 4.0 DCCs in Germany, Singapore, China, the US and Italy. Just as in most other industries, data is ubiquitous in the industrial markets of Industry 4.0. One can even wonder if Industry 4.0 isn’t all about data, in combination with analytics, artificial intelligence and other technologies where relevant. The problem with industrial data is that, just as is the case with other forms of data and information in any area of information management, tends to reside in silos such as ERP and industrial control systems but also in applications that really aren’t fit for an advanced use. More about the role of data and an example of applying data, analytics and AI in the oil and gas industry. In bridging the digital and physical worlds, a range of technologies is used in Industry 4.0: from the Internet of Things and cyber-physical systems to augmented reality. Spending on virtual reality and augmented reality is expected to grow strongly through 2021. Where discrete manufacturing and process manufacturing already account for a large part of AR/VR spending in 2017, the use cases of augmented reality in Industry 4.0 are evolving. On-site assembly and safety and process manufacturing training are important use cases, yet maintenance will increasingly become key. On top of that, applications such as prototyping, product design and simulations/test provide the case for AR/VR in Industry 4.0 as hardware and software matures. Top image: Shutterstock – Copyright: MNBB Studio – All other images are the property of their respective mentioned owners. – Images used for first infographic – copyright: respectively elenabsl and Maxfarruh All other images are the property of their respective mentioned owners.